IN what can be expected to be one of the biggest funerals in recent Namibian history thousands of people are expected to attend the memorial service and final internment of Omukwaniilwa Immanuel Kauluma Ellifas this coming weekend. In this regard the Government has availed buses to transport mourners to Onamungundo where the service will be held on Friday and Saturday. 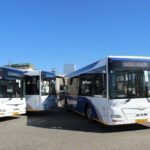 In a statement issued by the Ministry of Information and Communication Technology several pick up points have been designated and that the buses are set to start picking up mourners that want to attend the memorial service from 09:00 on Friday morning. In the same vein the funeral service at the old cemetery of Olukonda is set to start at 06:00 on Saturday morning. People whose intent it is to attend the funeral will have to be ready by 04:00 on Saturday at the designated pick up point. For the memorial service people residing in the Okankolo Constituency should be waiting at the Okankolo Centre, Shimbombela, Onyanyena next to Othithiya and Onnathinge. In the Onyaanya Constituency peope should wait at Onyati-Okamupanda, Onankali (near BH), Engoyi T Junction and Onyaanya Service Station. In the Oniipa Constituency people should wait at Oshigambo, Ekango Liyakahani Junction and the Oniipa Constituency Office. For the burial service on Saturday people in the Tsumeb Constituency should gather at the constituency office and at Oshivelo. People from the Guinas constituency must also wait at Oshivelo, Casablance King Kauluma and Omuhama Gwepandela. In the Nehale Lyampingana Constituency people should wait at Omutsegwonime, Omuthiya Gwiundi (U Save) and Oshifukwa. For the burial service on Saturday people residing in the Okankolo Constituency should be waiting at the Okankolo Centre, Shimbombela, Onyanyena next to Othithiya and Onnathinge. In the Onyaanya Constituency people should wait at Onyati-Okamupanda, Onankali (near BH), Engoyi T-Junction and Onyaanya Service Station. It is important to remember that on Friday the buses will be at the pick up points from 09:00 onwards and that on Saturday people will have to be ready and waiting by 04:00.